For some reason, I felt nervous. Even though this is our 20th country…and that probably means at least 19 border crossings, so there is nothing to be afraid, right? Maybe its genetic imprinting, from the time i was a little boy I’ve thought of borders as a horrendous experience and have been pleasantly surprised by most crossings so far. Maybe that genetic memory came back? The current situation with the Ruble exchange rate makes the food also more affordable in Russia…as we find out later…the exchange rate is not the only reason to shop at the Russian grocery stores, just trust me and stock up on everything you love. To our and my genetic memory’s surprise the border crossing was painless…relatively and took only 2 hours. The Russian side is very organized, clean and thorough. 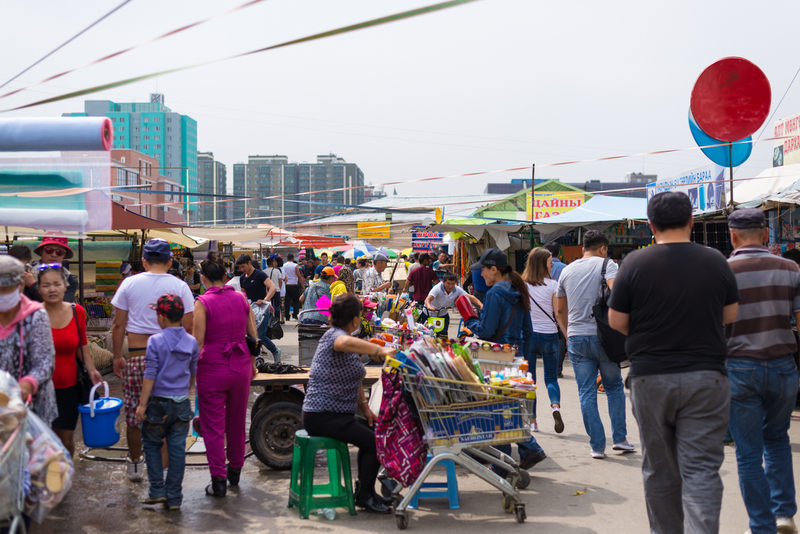 On the Mongolian side we got a very Central American feel…there were many steps, many people who demanded some sort of fees and taxes and gave you meaningless pieces of paper in return. We were charged a 10,000 tegrik road tax…you’ll see the irony of this later. 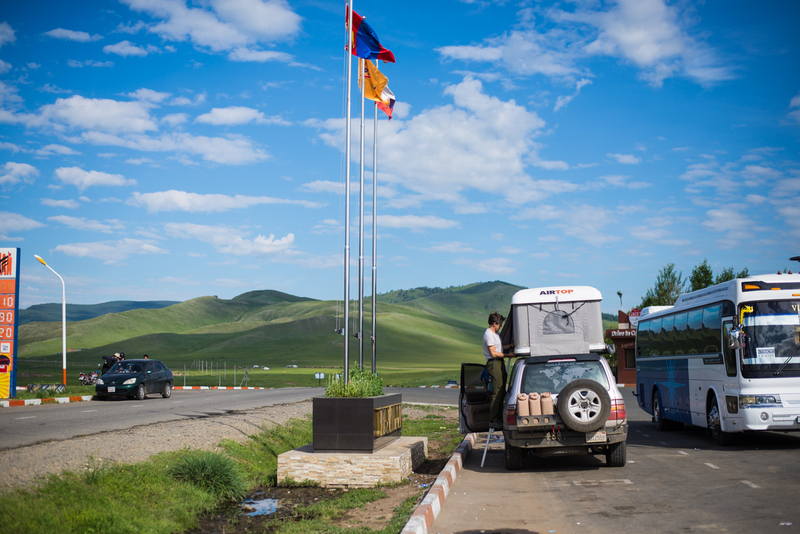 Got out of the border around 6pm, Ulaanbaatar is 250 miles away…we might make it. I honestly expected to not even have asphalt as soon as we crossed the border. There is a paved road from the border all the way to the city, I wouldn’t call it nice because for some reason there would be HUGE holes in it. These are not pot holes…these are axle-breakers, disk benders of a hole. During the day it’s not a problem, but as soon as it started getting dark I could no longer safely avoid them and we had to pull over 60 miles from the city. Slept at a gas station/truck stop. One of the worst nights, because it was loud and smelly. 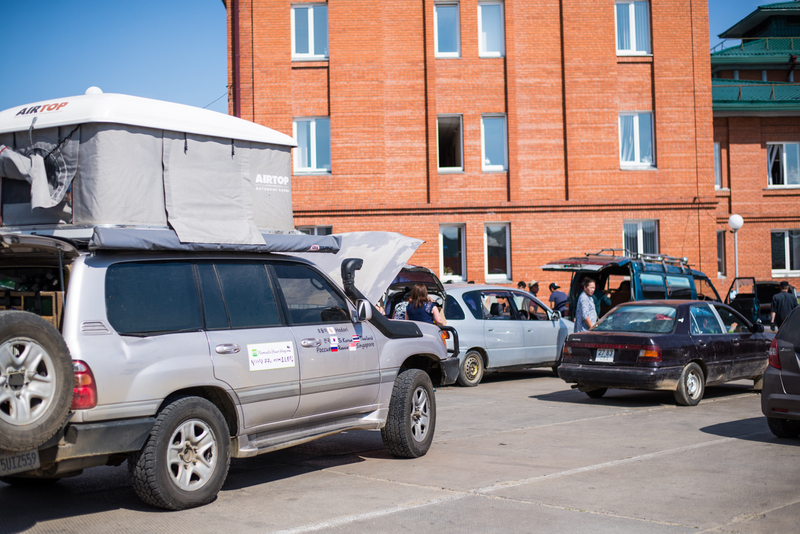 This is our mistake, we should have realized that we can’t make it and just drove off onto the steppe somewhere. 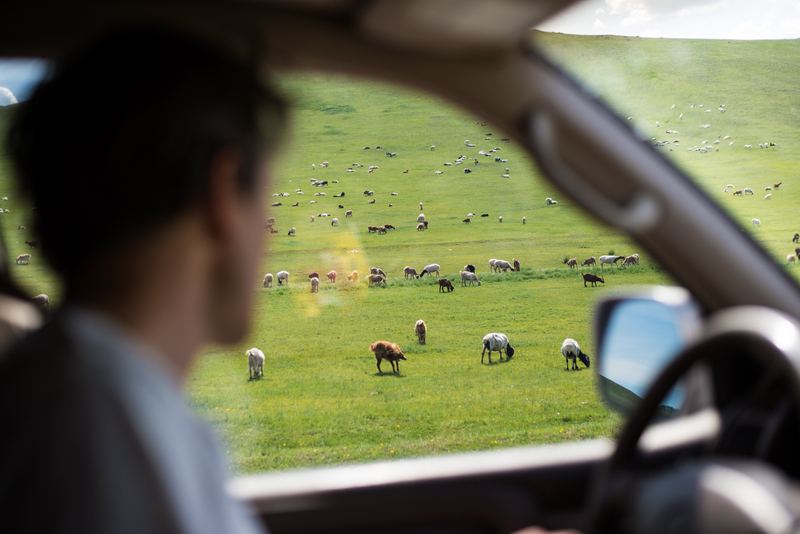 In the morning, with a clear head and eyes we looked around and saw the most beautiful green rolling hills accentuated with little gers and sheep. We could have camped in this amazing nature…if we would have thought ahead. 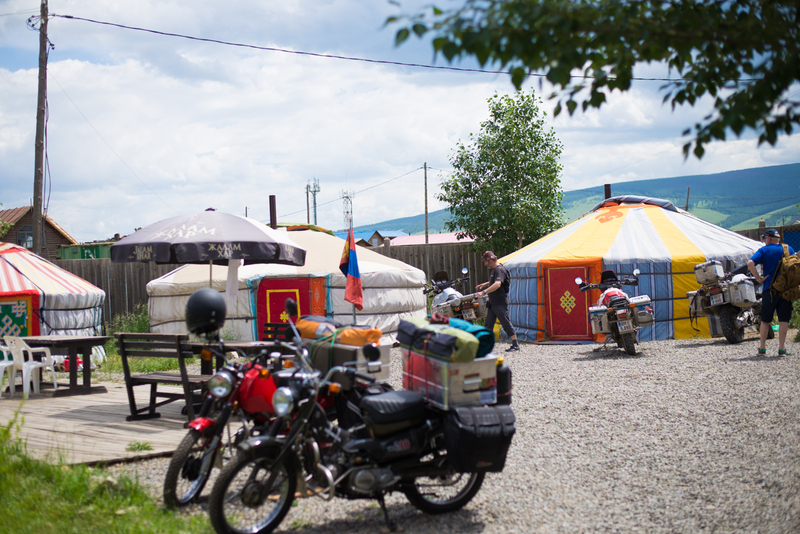 Mongolia is a country of freedom…you can camp ANYWHERE you want. 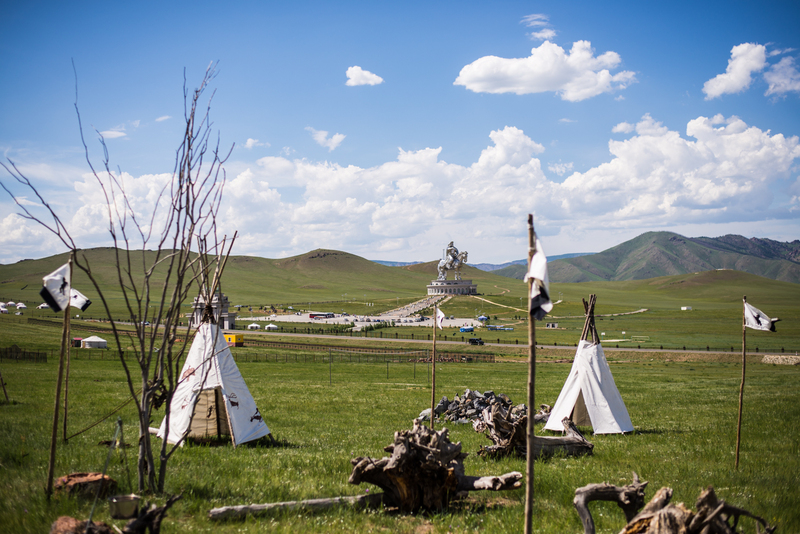 Outside of Ulaanbaatar, there are no fences, no private land…you can just got and camp. You just need to find a place during daylight, because during the night you risk accidentally falling into a little ravine, a little creek or a river…these are plentiful and can be anywhere, so be careful. 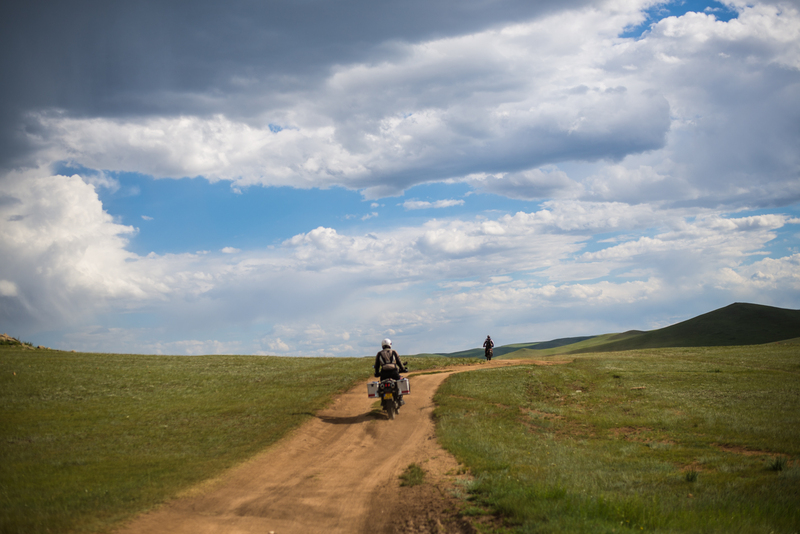 Already on the first day and within the first hours within Mongolia you get to see the picturesque, stereotypical views that you would expect. 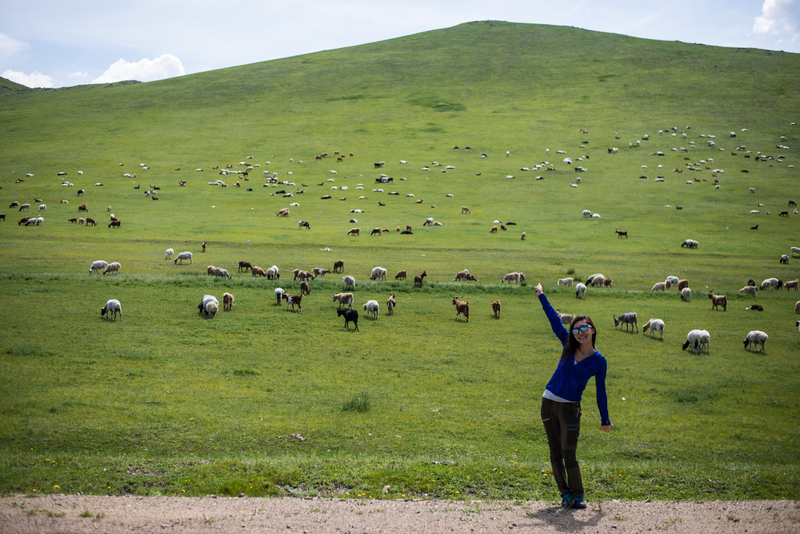 But about an hour before Ulaanbaatar they become better than you have ever imagined, even with real sheep and goats. Then just like out thin air, you go around a hill and see a large valley, surrounded by hills on the north and south and within the valley you see Ulaanbaatar…all of it, right there in front of you. In a moment you are taken out of the beautiful steppe and into the congested, dusty, busy city. We wanted to stay at the “Overland Oasis” which required crossing the city from West to East, a journey of only 7 miles but would take us over 2 hours. The official moment…the sticking of the sticker. I feel like we should play some orchestral music and stand at attention every time we put a new country on. 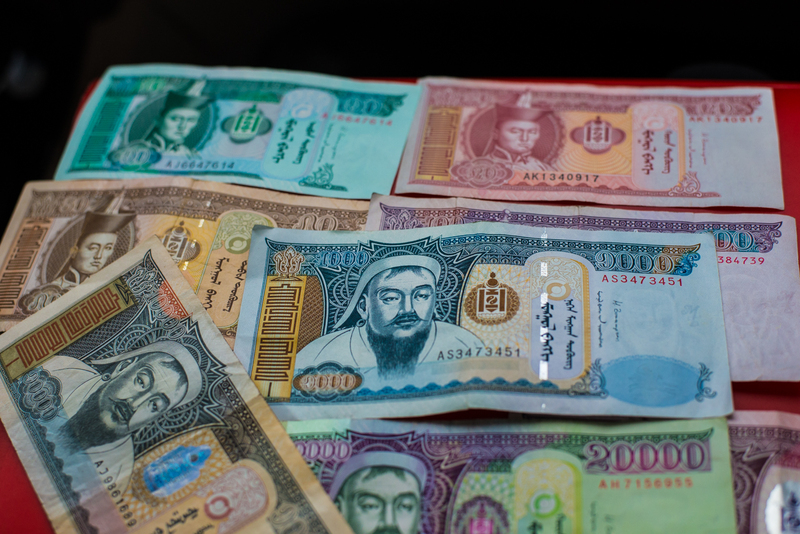 So thats the Mongolian money, official called tugrik, it features Genghis Khan (the dude with the beard) and Damdin Sukhbaatar (obviously the other dude). Btw Genghis khan looks more Chinese than I expected and much less menacing that i thought he would. I can imagine seeing him as a Chinese scholar. Aah… the “Overland Oasis”, from the description of other people i thought it would be the most amazing place in the world. I found it to be a little cramped and the food extremely expensive (but good). On the good side it does have a lot of people stopping by every night so you can catch on all the latest travel news in the world and especially Mongolia. 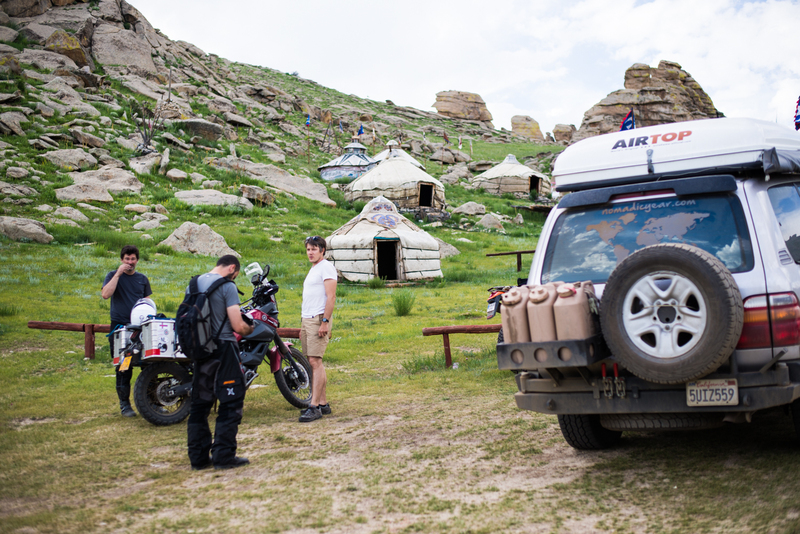 In our usual style of completely winging it we only knew our plans up to Ulaanbaatar, then we said to ourselves that we will ask around for the best way to go through Mongolia. 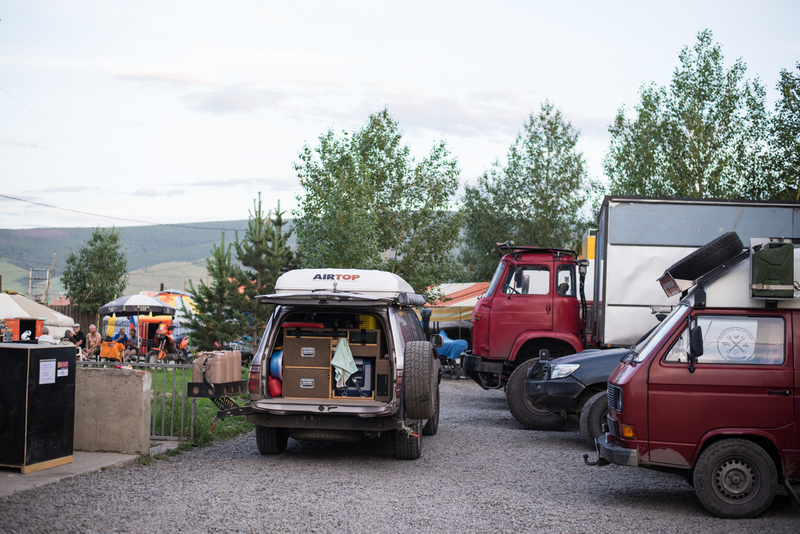 As luck would have it we met the same two German trucks that we saw on Olkhon Island on Baikal. We also met Youngjun, a fellow Korean traveler, who came over from Korea about a month and a half before us. He is not your average Korean rider that goes from Vladivostok to London in a b-line. I admire his soft-spoken attitude and sheer determination to have an adventure of a life-time, but not for publicity…for himself. 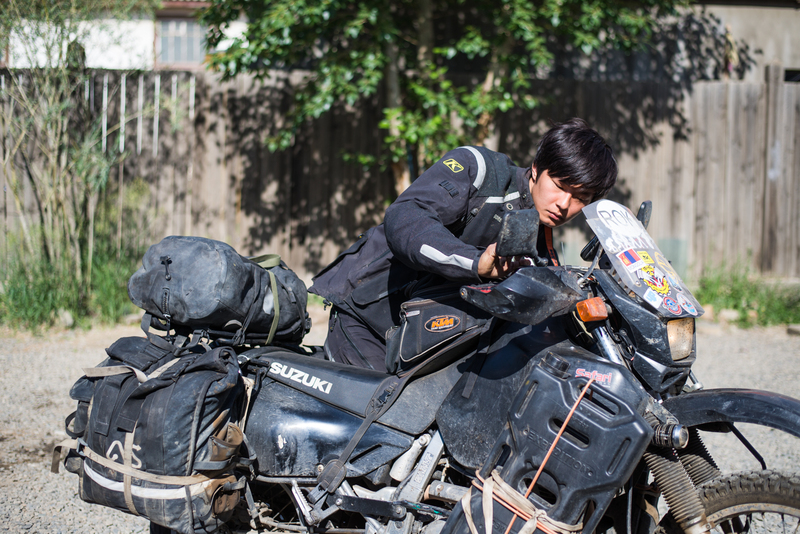 Since he got to Russia he has already done the “road of bones” to Magadan and rode around Sakhalin. He comes and goes without the need for saying good-bye or hello and when he returns after two days of being away, he comes over to talk to you like he just stepped out to the bathroom two minutes ago. Funny, I read his blog in Korean and although couldn’t understand much…i instantly saw our korean nickname in his writing – “왈가닥부부“, means crazy married couple. He saw the letter that Hyein wrote up and posted in the Korean motorcycle forum and mentioned us with addition of his comments. 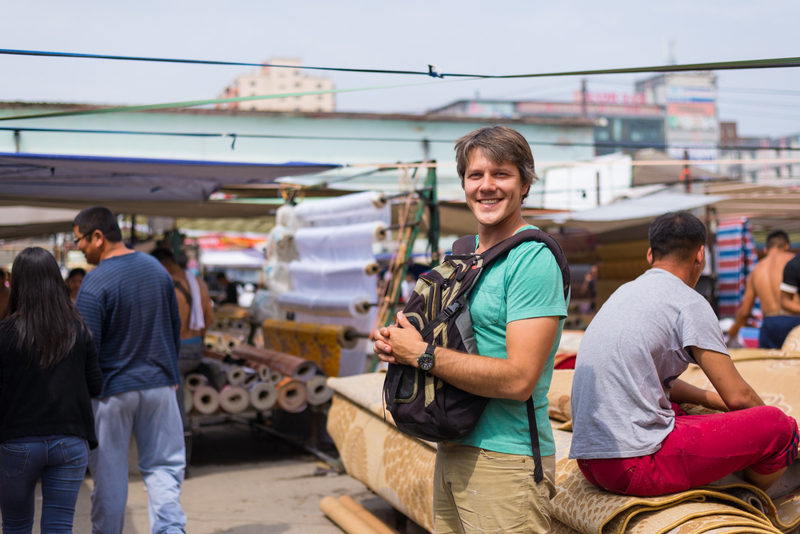 While Youngjun went of on one his mysterious adventures, we met up with Ricardo and Remco at the “Oasis” and decided to have a look around vicinity of Ulaanbaatar. 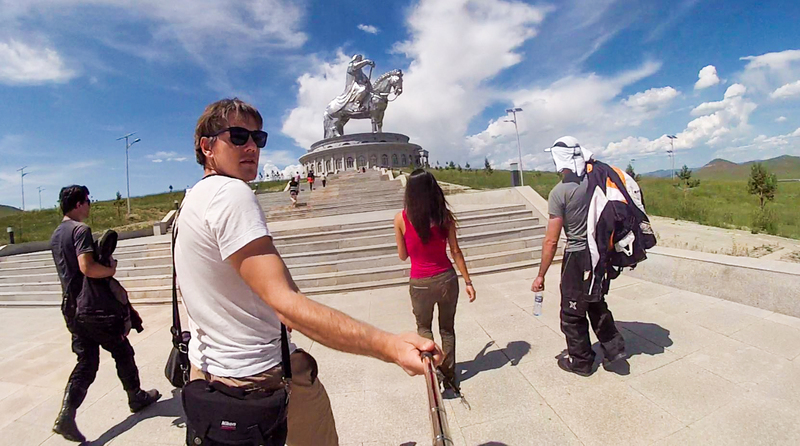 We heard that there is a huge Genghis Khan statue…so we obviously needed to check it out. About 50km East of the city, so depending on traffic anywhere between one and two hours of driving. Once you go through the main “arc de triumph” style entrance gate you can park and have a look around the place. If you are so inclined and we definitely are, for a few thousand tugriks you can hold and take pictures with a hawk. Although it’s probably not good to monetarily support the caging of these sky animals, we looked past our morals for once. When else are we going to get a chance to be close and hold such an amazing creature? Hyein said the hawk was extremely heavy and she had to use both of her arms to support it. As payback for being kept chained up the hawk walked all over her back scratching it up lightly. Don’t worry Hyein is okay. Now, if you are a real man then you can try to hold the vulture. This guy is almost twice the size of the hawk and Hyein couldn’t even try to support him on her arm. The first thing you notice about the statue is its size. 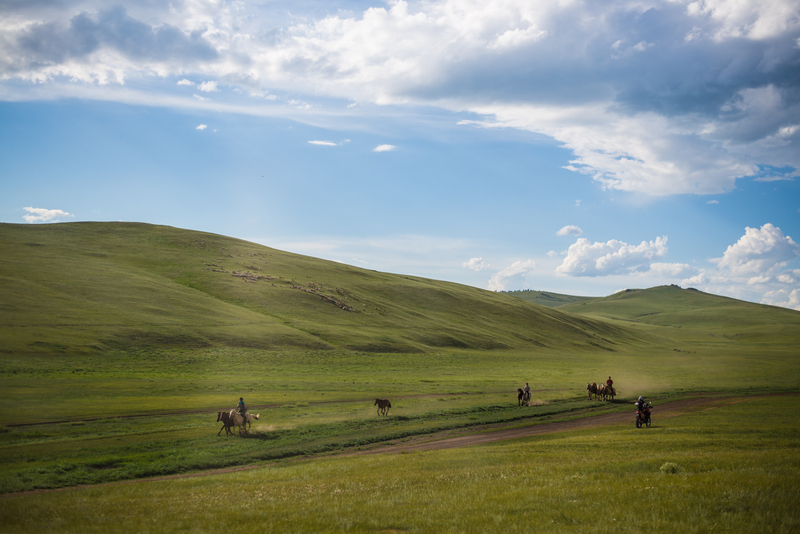 In the photo you realize that it is big…but once you get to see it in real life with the hills and steppe for comparison, then you realize that Genghis Khan stands tall over the sacred land of Mongolia. Reaaaally tall, i would say that he could be one of the tallest buildings in all of Mongolia…top 20 for sure. If you are so inclined you can pay some money and climb up the stair s to the top of the horse’s head. We were told by the other travelers that it is a waste of money and effort, so we did go. You can decide for yourself. There is a bit more for your sense of scale. 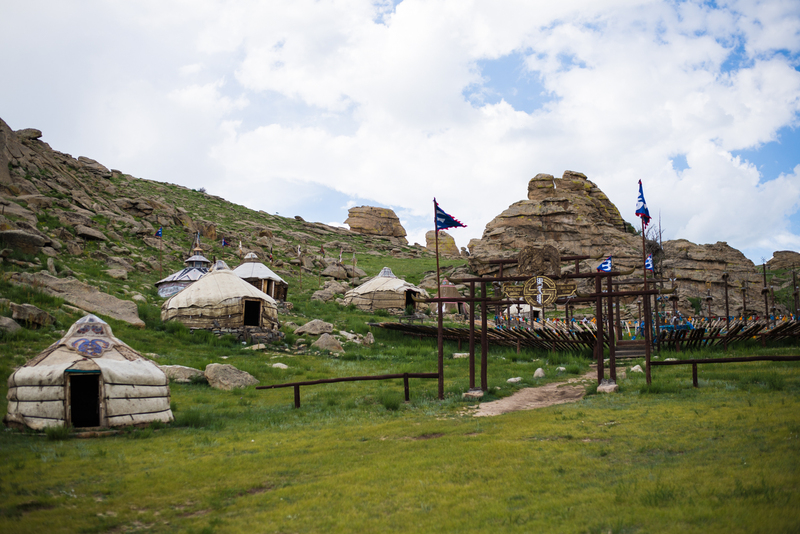 When you are in the presence of Genghis Khan you can’t help but think about Mongolia’s past. In the 13th century the Mongolian Empire was the largest country in the world and still to this date. Even Russia and the Soviet Union have failed to surpass it in sheer land area. From modern-day Korea to Poland, all of middle East and the Stans, i did some rough calculations and that is 22% of all the land area in the world…under one man. 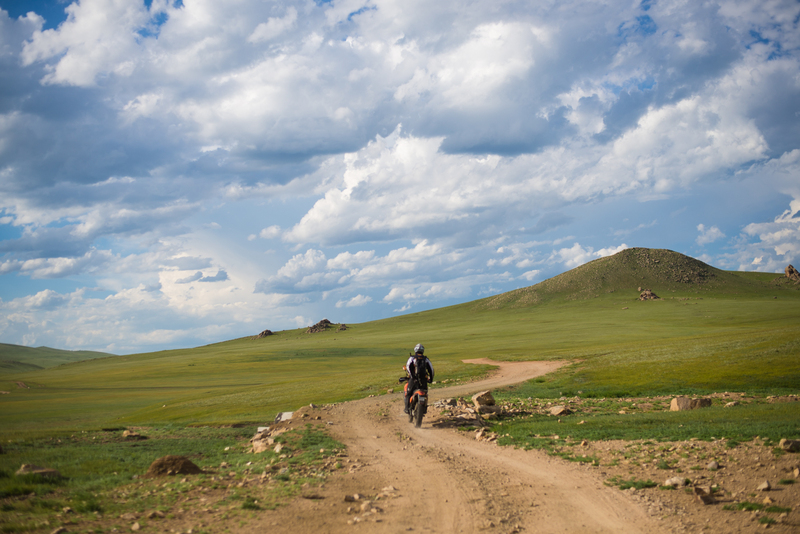 And think what you know about Mongolia now…not much. From the largest empire in history to the backwaters of civilization, how did this great empire take such a drastic turn for the worst? Well, that is a long discussion plus you didn’t come here for history lessons, so go read wikipedia if you are really that interested. One thing i have to say, to settle a very old argument i had with someone…Genghis Khan and the Mongols are not Chinese. They captured China not the other way around, don’t claim him as your own..
One more thing about the current state of affairs in Mongolia. 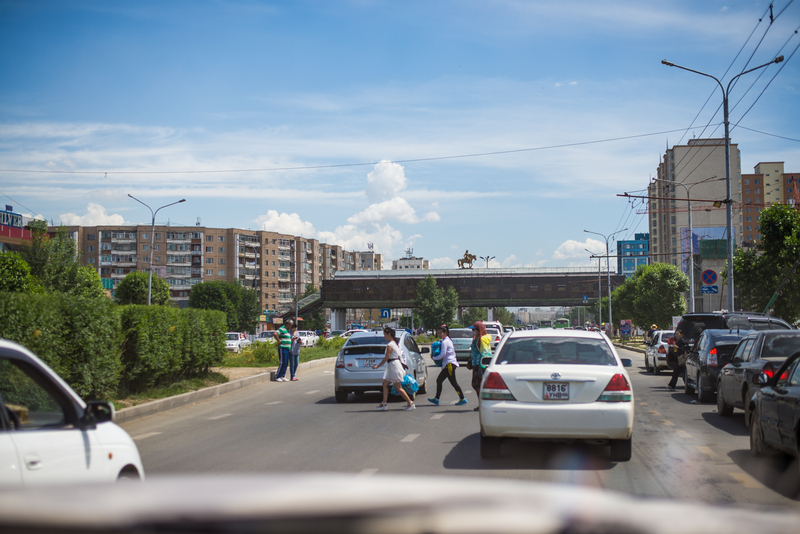 About half of the population lives in Ulaanbaatar in houses and apartments with running water, electricity, internet and public transport. And the other half lives literally like they used to live in the times of the empire. The true nomads, living in gers and moving around with their horses, sheep and goats. Like with any other statue the orientation and its location is very important. 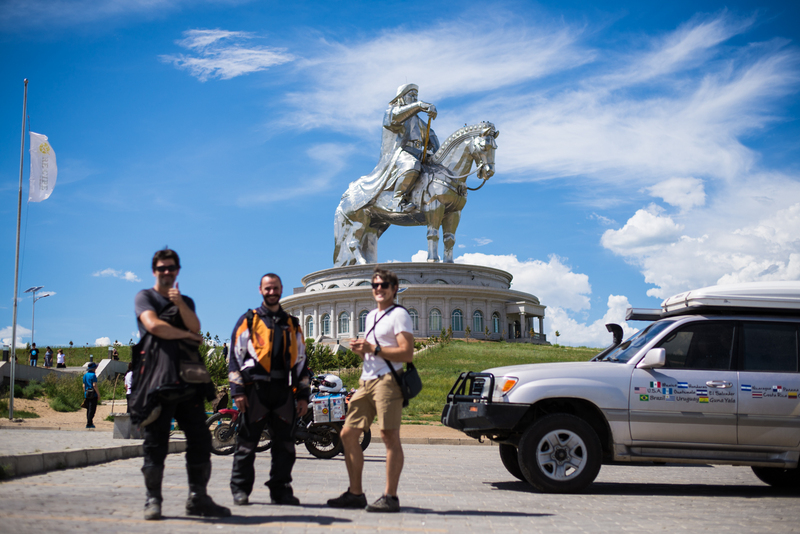 Turns out that the statue faces east towards Genghis Khan’s birthplace. I thought it was because he really liked China. After the statue we tried to go and find the 13th century ruins that were supposed to be somewhere nearby. Ended up driving about 25 miles off the main road on a very pleasant dirt road through the steppe. Only to find a…….shamanism camp. The actual ruins live up to their name…they are so ruined they dont exist anymore. We literally stood on the GPS coordinates and did not see even a single stone. Instead we decided that our original plan was to see the shamanism camp and took some photos. According to wiki about 4% of population practices shamanism. In the ten minutes we were hanging around the camp out of nowhere a lady showed up demanding money for the entrance to the camp. We politely packed our stuff and left. To be honest neither the ruins, nor the shamanism camp were the real reason for the drive. 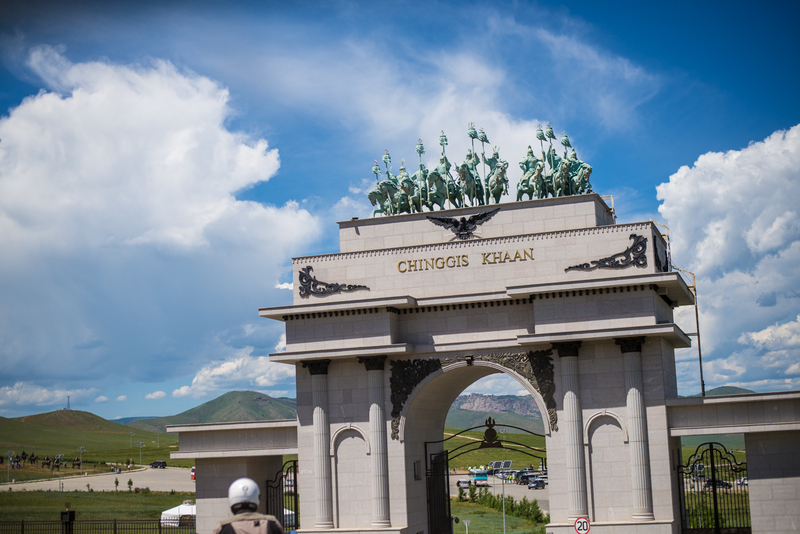 They were just an excuse for a destination so that we can drive through the beautiful country, away from Ulaanbaatar’s horrendous traffic and enjoy the serene lands in peace and quite. Remco on his Yamaha and Ricardo on his KTM led the way, flying through the hills and making our Hodori look like a couch with 4 wheels. You are just minding your own business, slowly driving when all of a sudden you see a bunch of young mongolian guys whiz past you on horses. We didn’t go to a special place to see these guys and they dont work for any park or a tourist attraction, they are just taking their horses back home. 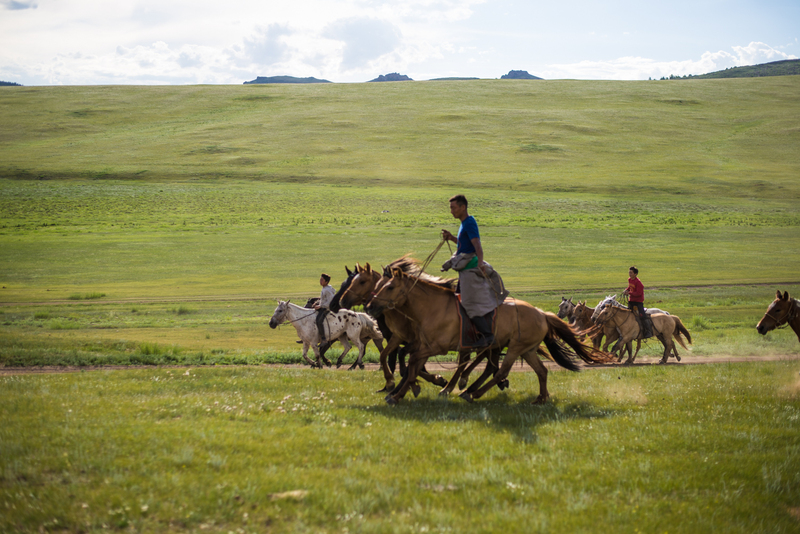 This is an everyday, mundane occurrence for the Mongols and the most exciting thing for us to see. Back to the “Oasis” and we realize that our spot has been taken and we have to park any way we can fit inside the gate. So far we have only visited the vicinity of the city and haven’t seen anything in the center. A quick search reveals that there are not that many things to visit and see, at least according to our searches and eyes. We were told to visit the “Black market”, no seriously that’s the official name. I thought it would live up to its name with all kinds of illicit drugs, guns and wares. In reality it’s just a market for all things Mongol. 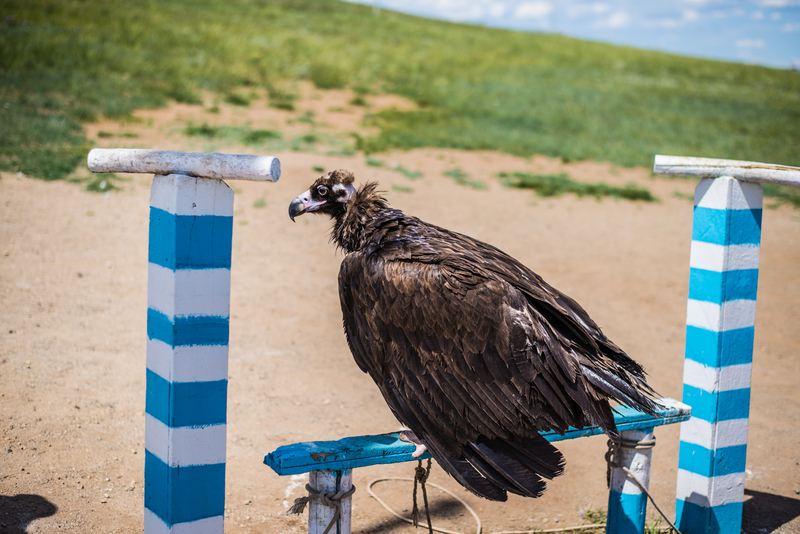 If you decided to leave all the comforts of your life in the states and moved to Mongolia with a full purpose of becoming a sheep herder, then the “Black market” should be your first stop after the airport. Here you can pick out your ger supplies, riding boots, carpets to put on the walls of our ger, whips, mosquito nets and pots for boiling sheep heads. We thought that we are nomadic enough already and just bought some gloves for dish washing. On a scale of awesomeness, i give it a 3 out of 5…on a scale of authenticity i give it a 10/10. 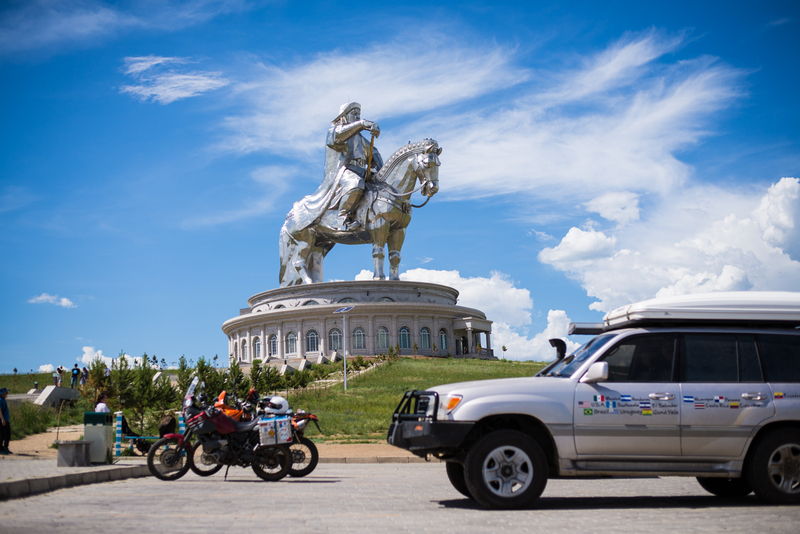 A short cab ride away, that cost about 800-1000 tugriks per kilometer and you can visit the Sukhbaatar square. 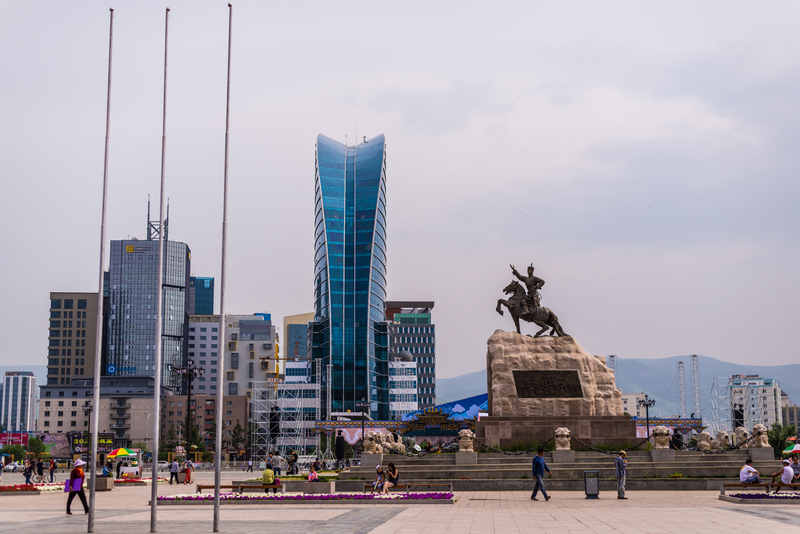 This is the center of the city and of Mongolia. The only few large buildings can be found within a walking distance of the square. And here it is, the man behind all of this mess – the great Genghis Khan himself. 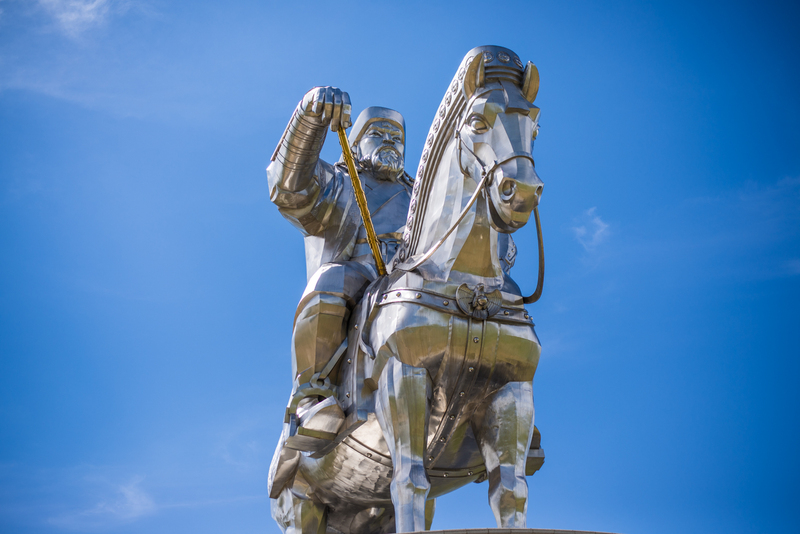 In Mongolia he is a very well-respected figure, with people admiring his rule and conquests centuries after he is gone. I read it somewhere on the internet so it must be true that almost a quarter of today’s world population can trace their DNA back to Genghis Khan. So Hyein, being a respectable Korean, is bowing to her ancestor’s statue. 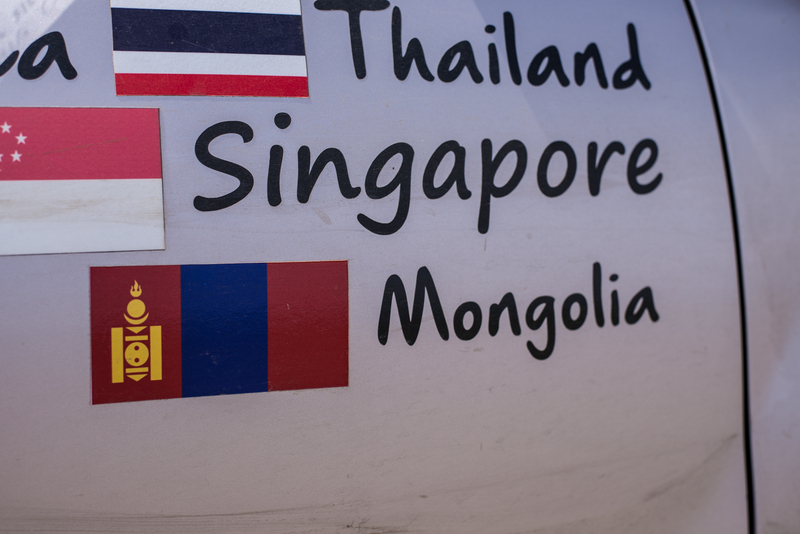 Come to think of it since both Russia and Korea were under the rule of Mongolia there is a possibility that somewhere far, far down the line of ancestors we share a common great-grandfather or mother. So according to my hand-wavy logic, if we have a child then he will be more Mongolian and more Genghis Khan than either Hyein or I. Lets do a little summary of the city and talk about things that for some reason didn’t fit in the main narrative. 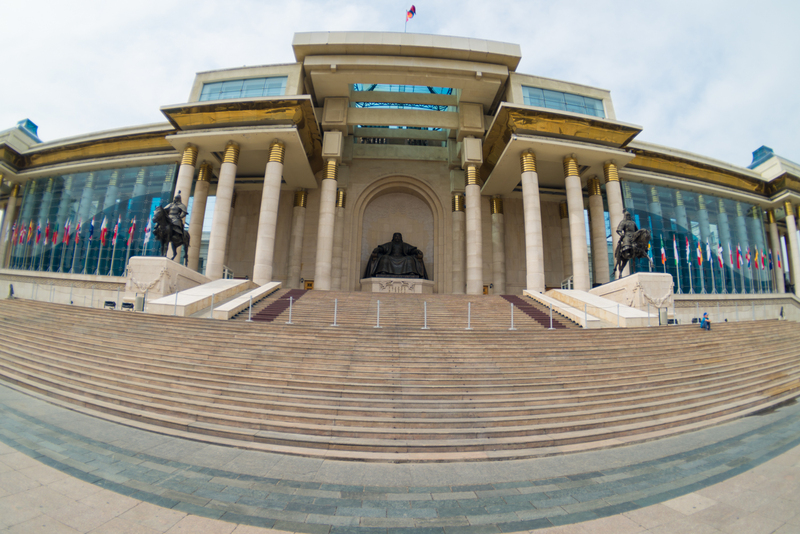 Should i visit Ulaanbaatar? Well, if you just come here to visit the city like you would do with Paris, London, Tokyo or Seoul, then you will be severely disappointed. The city itself doesn’t have a cohesive feeling, more like a collection of buildings from various historical times. The modern architecture and the communist style clash together in a eye-sore kind of way. It feels like there is no history in the city. I guess it makes sense, since what we consider history in the western world is usually some old buildings, historical quarters, parks, etc. But what do you get in a nomadic society? 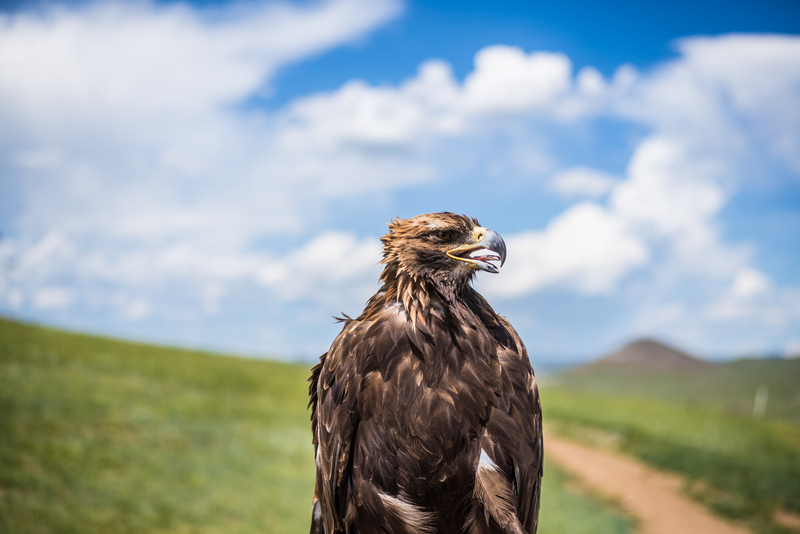 Gers that easily move with the wind that passes through the steppe. Only at the end of the 18th century Ulaanbaatar finally settled in its permanent present location, before it moved around 28 times…an easy thing to do when your whole city is made of gers. 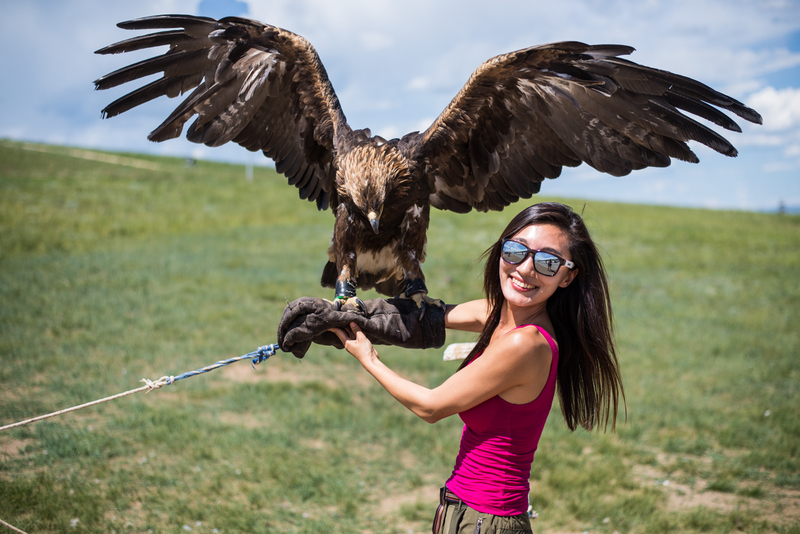 Should i visit Mongolia? Short answer, yes. Read the following posts to see for yourself why this is considered one of the greatest countries for offroading, freedom and nature. Imya u nego ochen horoshee!